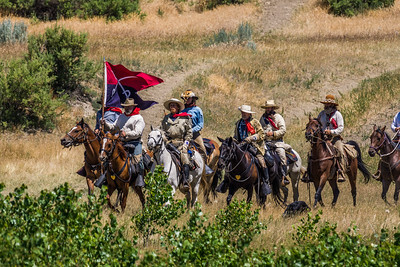 This gallery is comprised of photos I captured at the 2016 "Battle of the Little Bighorn Reenactment" in Crow Agency, Montana. 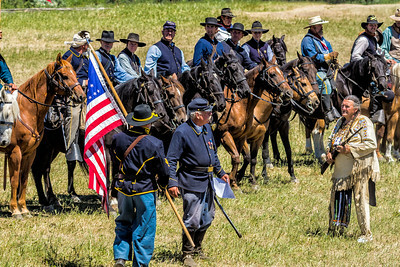 This event is held every year on the Anniversary of "Custer's Last Stand". 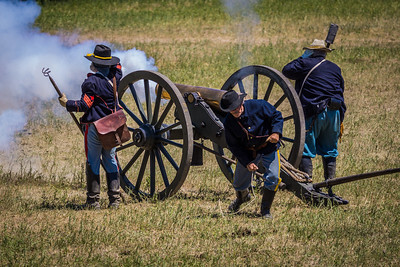 Learn and experience the historic struggle for control of the West by visiting the amazing Little Bighorn Reenactment firsthand - where the Sioux Nation was encamped. 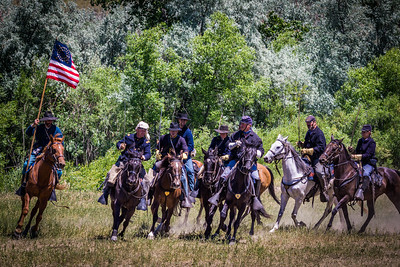 ​I captured this image at the 2016 Little Bighorn Battle Re-enactment, at the actual site where the battle took place, June 1876. Custer and his entourage are approaching the Little Bighorn River. The U.S. 7th Cavalry, including the Custer Battalion, a force of 700 men led by George Armstrong Custer, suffered a significant defeat. Five of the 7th Cavalry's twelve companies were annihilated; Custer was killed, as were two of his brothers, a nephew, and a brother-in-law. I captured this image at the 2016 Little Bighorn Battle Re-enactment, at the actual site where the battle took place, June 1876. The 7th Cavalry is​ riding in a charge formation. The U.S. 7th Cavalry, including the Custer Battalion, a force of 700 men led by George Armstrong Custer, suffered a major defeat. Five of the 7th Cavalry's twelve companies were annihilated; Custer was killed, as were two of his brothers, a nephew, and a brother-in-law. I captured this image at the 2016 Little Bighorn Battle Re-enactment, at the actual site where the battle took place, June 1876. The 7th Cavalry is​ firing a cannon across the Little Bighorn River into a Lakota Indian village. The U.S. 7th Cavalry, including the Custer Battalion, a force of 700 men led by George Armstrong Custer, suffered a major defeat. Five of the 7th Cavalry's twelve companies were annihilated; Custer was killed, as were two of his brothers, a nephew, and a brother-in-law. I captured this image at the 2016 Little Bighorn Battle Re-enactment, at the actual site where the battle took place, June 1876. 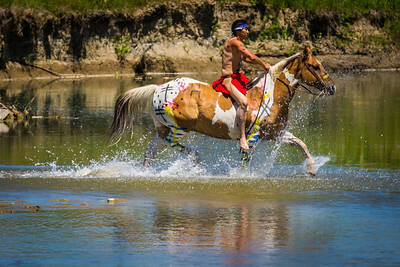 The battle-ready Lakota Warrior is ​riding across the Little Bighorn River. The fight was an overwhelming victory for the Lakota, Northern Cheyenne, and Arapaho, led by several major war leaders, including Crazy Horse and Chief Gall, inspired by the visions of Sitting Bull. Five of the 7th Cavalry's twelve companies were annihilated; Custer was killed, as were two of his brothers, a nephew, and a brother-in-law. 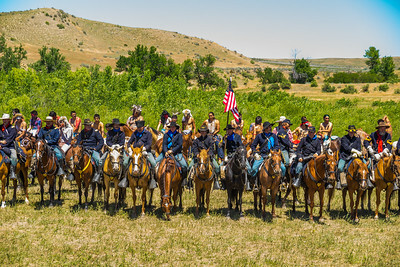 ​I captured this image at the 2016 Little Bighorn Battle Re-enactment, at the actual site where the battle took place, June 1876. 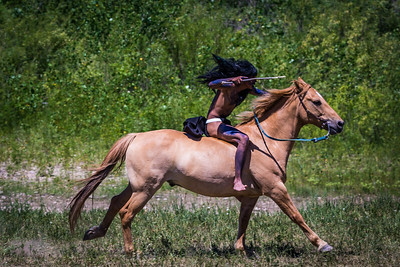 A Lakota worrier is riding into battle. The fight was an overwhelming victory for the Lakota, Northern Cheyenne, and Arapaho, led by several major war leaders, including Crazy Horse and Chief Gall, inspired by the visions of Sitting Bull. Five of the 7th Cavalry's twelve companies were annihilated; Custer was killed, as were two of his brothers, a nephew, and a brother-in-law. 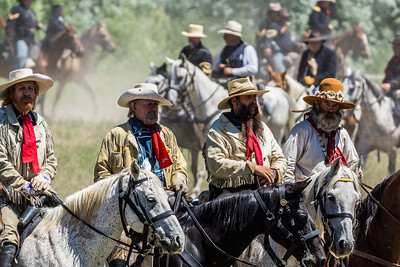 ​I captured this image at the 2016 Little Bighorn Battle Re-enactment, at the actual site where the battle took place, June 1876. 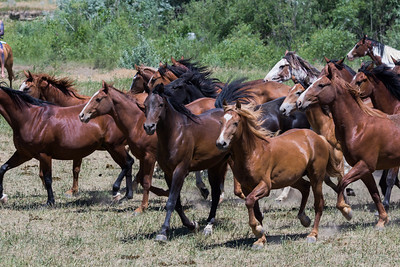 The Lakota Indians are rounding up a herd of over 100 horses before the action begins. Horses forever changed life on the Great Plains. They allowed tribes to hunt more buffalo than ever before. They tipped the balance of power in favor of mounted warriors. And they became prized as wealth. For Native Americans today, horses endure as an emblem of tradition and a source of pride, pageantry, and healing. I captured this image at the 2016 Little Bighorn Battle Re-enactment, at the actual site where the battle took place, June 1876. 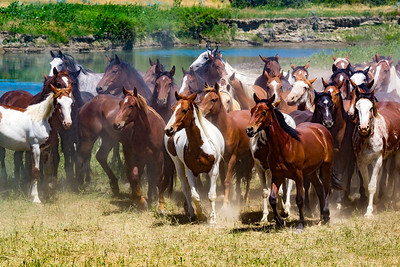 The Lakota Indians are rounding up a herd of over 100 horses before the battle begins. Horses forever changed life on the Great Plains. They allowed tribes to hunt more buffalo than ever before. They tipped the balance of power in favor of mounted warriors. And they became prized as wealth. For Native Americans today, horses endure as an emblem of tradition and a source of pride, pageantry, and healing. I captured this image at the 2016 Little Bighorn Battle Re-enactment, at the actual site where the battle took place, June 1876. 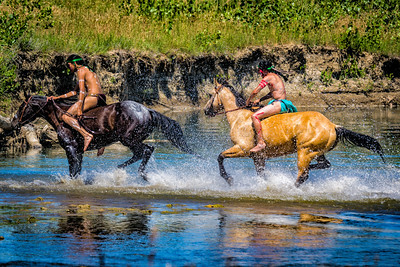 The Lakota Indians are rounding up a herd of over 100 horses over the Little Bighorn River and before the action​ begins. 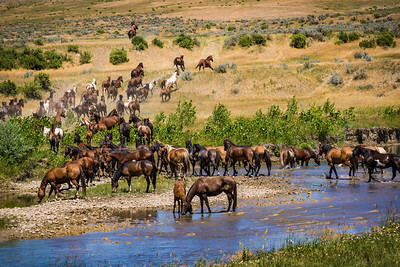 Horses forever changed life on the Great Plains. They allowed tribes to hunt more buffalo than ever before. They tipped the balance of power in favor of mounted warriors. And they became prized as wealth. For Native Americans today, horses endure as an emblem of tradition and a source of pride, pageantry, and healing. I captured this image at the 2016 Little Bighorn Battle Re-enactment, at the actual site where the battle took place, June 1876. 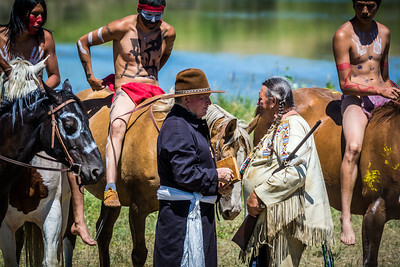 Here is a re-enactment of Lewis and Clark meeting with Plains Indians. 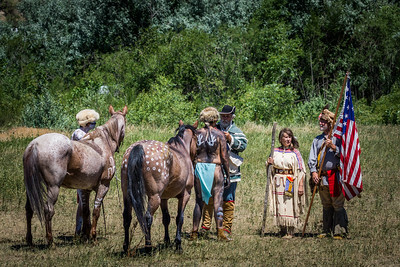 Lewis and Clark's meetings with Plains Indians focused on two principal goals. One was diplomatic–to apprise the tribes of United States' sovereignty under the Louisiana Purchase and to explain the purposes of their mission. They also wanted to establish intertribal peace. It is doubtful that many Plains Indians understood the meaning​ of exploration, nor did they grasp the idea of diplomacy outside of trade. 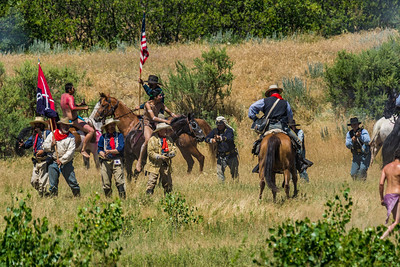 I captured this image at the 2016 Little Bighorn Battle Re-enactment, at the actual site where the battle took place, June 1876. This photo is of the Christian Missionary introducing Christianity to the Plains Indians. Christian missionaries promoted strategies to transform Native American communities in the Great Plains. Over time, tribal members selectively accepted specific​ cultural components while actively preserving Native traditions. Missionary contact with Great Plains tribes increased during the nineteenth century. I captured this image at the 2016 Little Bighorn Battle Re-enactment, at the actual site where the battle took place, June 1876. 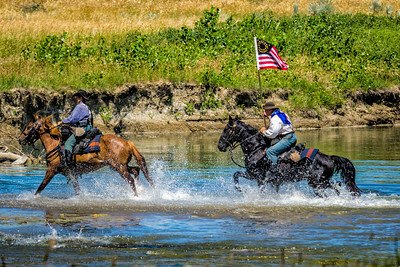 This photo is ​the 7th Cavalry riding across the Little Bighorn River into Indian Territory. The U.S. 7th Cavalry, including the Custer Battalion, a force of 700 men led by George Armstrong Custer, suffered a major defeat. Five of the 7th Cavalry's twelve companies were annihilated; Custer was killed, as were two of his brothers, a nephew, and a brother-in-law.